How's that for a workout view? Running on the sand feels about 10 times harder than it does on the pavement or trail. A beach boot camp seems about 10 times more difficult than it does at the gym—maybe it was all the sprinting? I can only imagine that doing yoga on the beach would be more challenging, in a good way, than it is in the studio—even if it’s a heated room and I’m dripping sweat all over my mat. You have the sand’s uneven surface that even a yoga mat can’t completely flatten out to challenge your balance. You have the sun radiating its summer heat to challenge your temperature acclimation. You have the wind’s cool breezes and the city’s humidity to mess with your body’s cooling system. You have the yoga itself to challenge your mind-body connection and any uber-tight muscles. 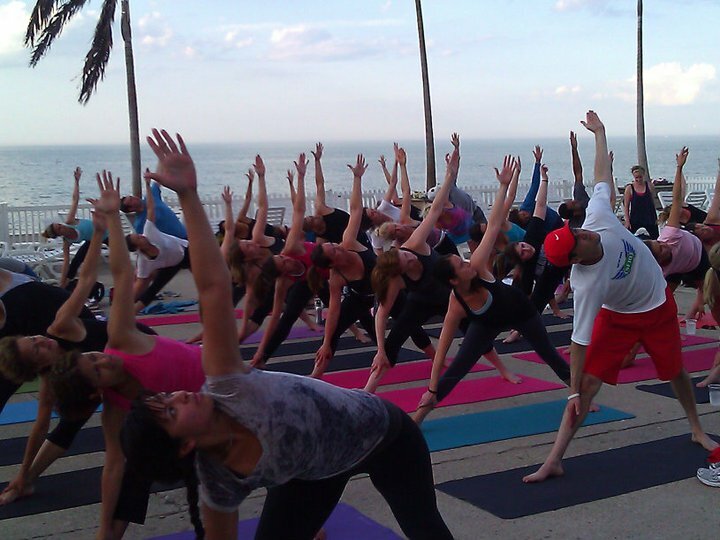 There will be plenty of yogis taking their practice to Chicago’s Oak Street Beach this month. Every Tuesday (except for July 2), Equinox is bringing yoga to the beach for ‘Find Your Chi,” a four-week series of exclusive yoga classes. 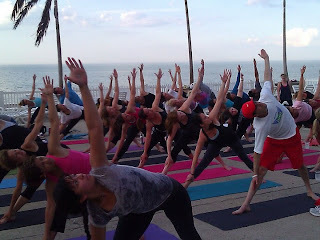 These sweat sessions happen from 6:15 p.m. to 7:15 p.m. at Oak Street Beach Food + Drink (1001 North Lake Shore Drive), the city’s go-to beach bar that’s just steps from Lake Michigan, and are led by Equinox instructor Stacy Levy Mann. Yogis get to sample different yoga types each week from your typical flow classes to a hip-hop variety (I think I’m going to have to check that one out on July 30 because I have no idea what to expect). July 9 brings vinyasa yoga, there’s power flow yoga on July 16, and July 23 has a restorative flow yoga (that has to be good for anyone running the Rock ‘n’ Roll Half on July 21). If you’re one of the first 25 Equinox members at class, you don’t even have to worry about bringing a mat; non-members are asked to BYOM (bring your own mat!). But can you really complain when classes are free, provided you RSVP at this link? And I'm guessing this'll be just as great as June's rooftop addition. What might be just as appealing as the yoga is the post-workout treats provided by the Oak Street Beach Food + Drink. The outpost created a special menu of healthy appetizers and skinny cocktails that they’ll be serving, in addition to all their regular items, after all those downward facing dogs. Think skinny dips, a yoga-tea-ni, and a watermelon mojito—my mouth is watering already. Have questions? Email rsvpchi@equinox.com. Want some lakeside yoga? Grab your spot here. I know I’m signing up!